This volume contains guitar solos op. nos. 1 through 9. 80 pages. 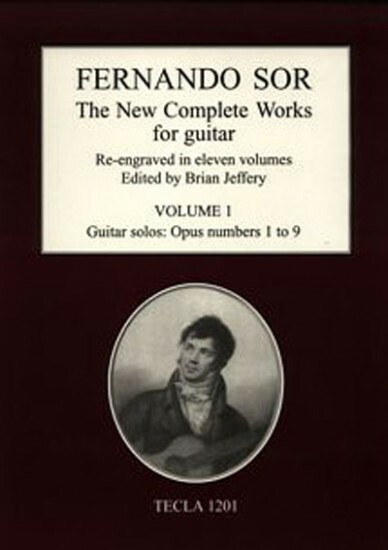 This is Volume 1 of the new re-engraved edition of Sor's works for guitar solo and guitar duet. Op. 3: Theme and Variations. Op. 5: Six petites pieces. Op. 9: Variations on a Theme of Mozart. The complete eleven volume set is also available. It is also possible to purchase only the complete guitar solos (volumes 1-7) or only the complete guitar duets (volumes 8-9 in score or volumes 10-11 parts). Also see the complete eleven volume cloth set. Excellent collection and format. I intend to purchase each volume. Highest Quality.